What happens if we burn all the fossil fuel reserves that we have? Here I'm doing my own simple arithmetic. Above all, the Working Group I's contribution to the Fifth Assessment Report (AR5) of the Intergovernmental Panel on Climate Change (IPCC) states that there is a specific threshold (purple line in the figure below) of total carbon emissions to us, Homo sapiens. To check the global surface temperature rise within 2°C (degrees Celsius) from the pre-industrial level, we have to limit our cumulative carbon emissions since 1870 to no more than 790 gigatonnes of carbon (GtC) or 2900 gigatonnes of CO2 (GtCO2). The AR5 estimated that about 515 GtC (1890 GtCO2) had been emitted from 1870 to 2011 (blue line in the figure). The number includes emissions from land use change in addition to the emissions from fossil fuel combustion and cement production. The Carbon Dioxide Information Analysis Center estimated that the global cumulative anthropogenic carbon emissions from fossil fuel combustion and cement production were about 370 GtC (1360 GtCO2) between 1870 and 2011. The remaining 145 GtC (530 GtCO2) seems to be emitted from land use change. Therefore, at the beginning of 2012, we had only 275 GtC (1010 GtCO2) of carbon at our disposal. Then, we can now go back to the question I asked in the first line of this post. "What happens if we fully exploit the fossil fuel reserves on earth?" In 2011, the annual global carbon emissions were 9.46 GtC (34.7 GtCO2). If we don't change our fossil fuel consumption habits, we will use up the remaining 275 GtC in only 29.1 years. If we consume the entire fossil fuel reserves, we will eventually emit approximately 930 GtC (3400 GtCO2) of additional carbon in 81 years (= reserves-to-production (R/P) ratio of the global fossil fuels in 2011) or by 2092. We will pass the threshold and go further to emit 655 GtC (2390 GtCO2) more. 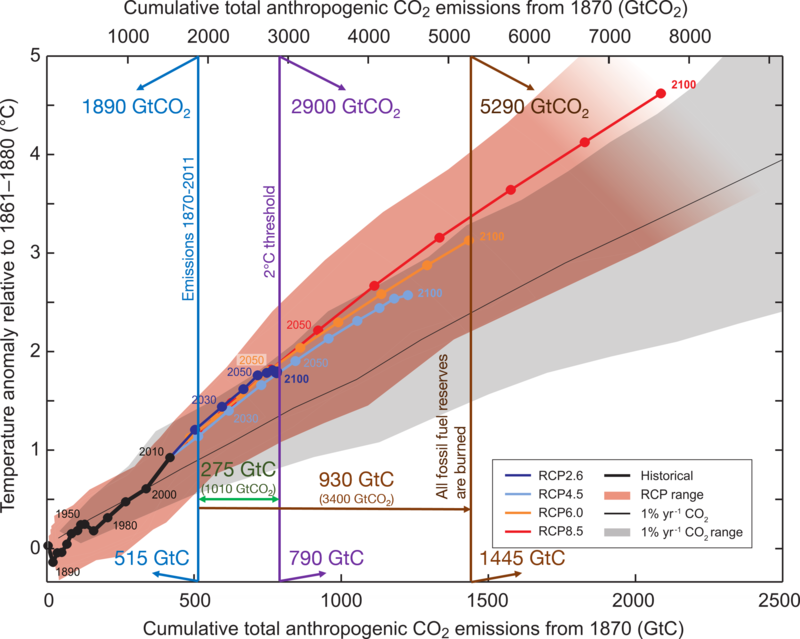 This self-destructing anthropogenic emissions will follow a global emissions trajectory that is little short of the IPCC's second-fastest global warming scenario (RCP6.0; orange line in the figure). The RCP6.0's additional cumulative CO2 emissions between 2012 to 2100 are estimated 1060 GtC (3885 GtCO2), while the total additional CO2 emissions by burning up the entire fossil fuel reserves between 2012 and 2092 are 930 GtC (3400 GtCO2). It means our extravagance could result in 3°C global warming around the end of the 21st century (Rogelj et al., 2012).